I learned quite a lot this week about something that I take totally for granted. Really Simple Syndication or RSS, is the mechanism used to allow users to curate information and content from a variety of websites, blogs and other content providers on the World Wide Web. Rather than visiting each site individually to read new posts or entries, a user can set up an RSS feed through a feed aggregator such as Feedly or NewsBlur and receive a listing of new content on a regular basis. Through a user dashboard, content can then be skimmed through quickly and organized by category for logical access and curation. 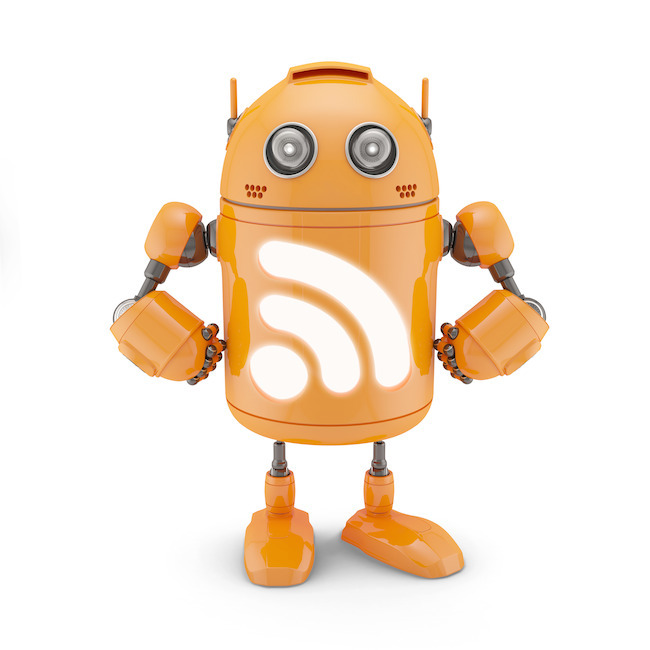 RSS feeds usually only include summaries of content and not the full text of the content itself. One of the several advantages of RSS feeds vs. email subscription to content includes the fact that users do not have to disclose email addresses to subscribe and can easily remove a feed from their aggregator account without going through a process of unsubscribing. This is especially important when asking students to access class related content in a weekly manner while giving them the option to maintain privacy and not use personal emails to subscribe to sties. Additionally, RSS aggregators such as Feedly make it very easy to share information out to other social networks such as Twitter, Google+ and Facebook. This kind of sharing is what can help individuals or groups establish a professional presence online and make additional connections with others on a larger scale. One downside to RSS feeds is that they can become overwhelming all by themselves. If the user is not regularly reading items in the feeds or managing the settings in the feeds to control updates and unread items, they can easily become swamped with information sources that would take hours to sift through. It’s important to establish some kind of information curation strategies and become familiar with the organizational tools a particular feed reader application has to stay on top of information sources coming into the feed. More digital information skills to master! I’ve used RSS regularly for myself, but am now thinking I need to plan for ways to model its use in courses that I teach through my community college. I’ve come up with three broad strategies that are listed below. Setting up an RSS feed that is embedded in an online class wiki or page provides an easy to access source for students to pull topics and news items into their discussions in the course. A weekly group discussion assignment could be built around an RSS feed that is made available to the class or alternatively, students can offer up content they have found in their own personal feeds. Students could then use digital research skills to find additional primary and secondary resources to back up their opinions in the discussion or critique the information in the original source item. I’ve used blogging in my online marketing business class as a way for students to learn how to set up and manage a professional business blog for a client. In addition, students use their blogs to start making professional connections with thought leaders in particular industries, following on social media. Students could also use RSS feeds to assemble information and sites that they want to include in their PLN. They could then submit their blog, lists of feeds and describe social connections they have cultivated for the quarter as part of a final portfolio. Students could then continue to subscribe to certain feeds long after the class is over. I also see RSS feeds as a way for faculty groups to establish information sources for their work in faculty learning communities and as well as in their personal professional development. We use Canvas by Instructure as our learning management system (LMS) for regular online courses and faculty have adopted it for committee and learning community use to share ideas, store information and conduct discussions and research. RSS feeds could be integrated in a Canvas classroom area and made available to the group by an instructor, or the content of the feed could be built by the group themselves as a collaborative project. I have not usually set up RSS feeds in teacher training courses, but have used some magazine applications such as Flipboard and Storify to create curated information sources to use in discussion groups and as topics for group work. These operate on a similar idea to RSS feeds, but require a bit more user management. The Canvas LMS easily connects with a lot of third party applications that can be integrated into the course environment (a few feed reader applications are available) as well as being able to embed Twitter feeds, FlipBoard and Storify magazines easily for access through the classroom space. It would be interesting to create a collaborative project such as this in the next faculty training course.